To help meet customer demand and improve reliability, a new timetable for the services has also been introduced to reduce delays on key routes, particularly the A19. New connections on the X10 include Dalton Park, following customer feedback highlighting over 50% of passengers support the shopping village stop-off. 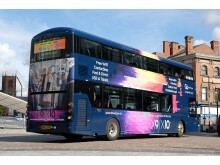 With bright and iconic livery, wi-fi, comfortable leather seats, USB power sockets and next stop audio-visual announcements, the seven double deck buses are fitted with Euro 6 engines to reduce harmful emissions while providing a smoother journey. 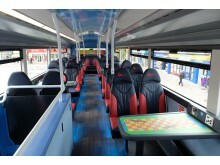 For the entertainment of passengers, the upper deck of the vehicles also feature gaming tables, including popular casino favourites and snakes and ladders. To celebrate the vehicle launches, managing director Kevin Carr gave Tees Valley Mayor Ben Houchen a recent tour of one of the buses, during a stop-off on Stockton High Street. 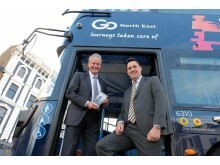 “This is a significant investment by Go North East, which will provide bus passengers with an enhanced service and fantastic new vehicles. Sustainable, comfortable and efficient public transport and improved connectivity are a key part of our plans for the Tees Valley and I welcome the commitment shown by Go North East to supporting this and to putting passengers first and improving their journeys,” said Tees Valley Mayor Ben Houchen. 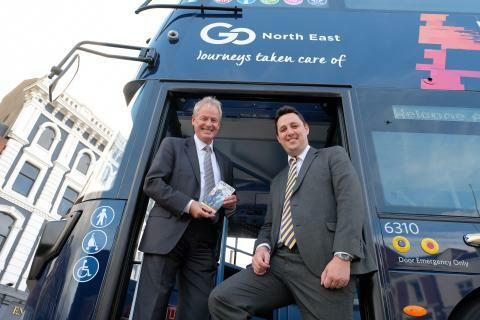 Kevin Carr, Managing Director of Go North East, added: “Our X9 and X10 services have become something of an institution with local passengers, with many of them having frequented the services for many years. We know that nearly three quarters of them use the service for leisure purposes and nearly a quarter are commuters, so our new features and connections aim to enhance the journey experience.